Ciaron O'Reilly has no income and thus rely 100% on people like you and me. That said, if you are like me, you will be sceptical about this page. I am a close friend of Ciaron and I support him a lot, specially when he is in London sleeping rough for Julian Assange. You can rest assured all your support will go 100% to him. He will be most grateful. Ciaron made a video about his life -------> https://youtu.be/ZSyZI1kGrHs <------- watch watch watch watch watch watch!! "Remembering Forgetting - A Journey of Nonviolent Resistance to the War on East Timor"
by Fr. Daniel Berrigan S.J. might have added the U.S. as well, where he and I first met, happily for me. on a compliment that often comes his way. In his estimate it misses the mark. of courage. Speak rather of faith. ho-hum culture of the self-damned. And in time the wall falls to rubble. You walk. undeservedness on the part of you, me, anyone. Yes, The Gift, infinitely to be honoured, esteemed, cozened with a Capital Letter. continents, this restless nimble spirit, this (literally and metaphorically) Gifted one. of our torrid, tormented era. of tears to be sure, but a joyous dance as well). there's no free trip, there's a toll gate on every highway. there. Pay up or join the inhumans. God help us and God be thanked. And hey Ciaron - a kiss on the hand to you. The Irishman, he's living (count them), two times a life! On behalf of Ciaron, I wish to say thank you very much for the donations. 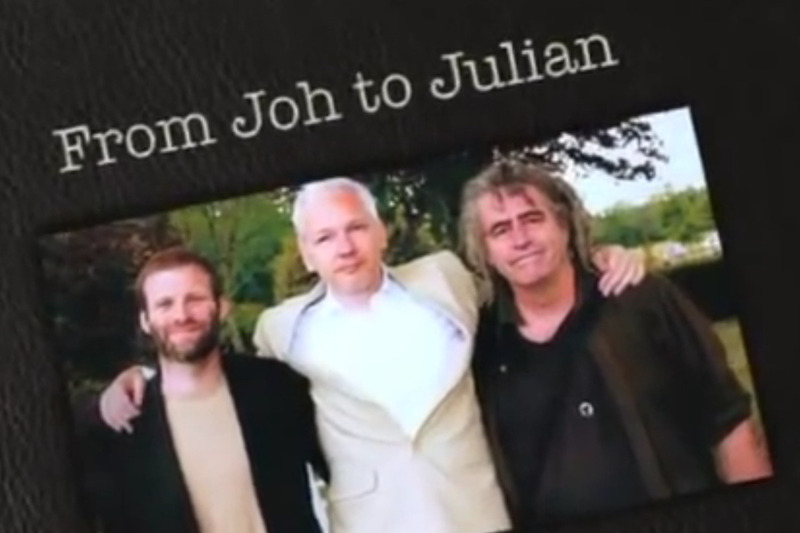 He will be at the QPR football grounds tomorrow, Saturday the 22nd of September, 14.00-18.00, campaigning for Julian Assange. I will be right next to him, handing him the funds you have so generously donated. Your generosity has not gone missed.